The recession has been brutal for Spokane’s live theater. Two theaters closed, others teetered. Meanwhile, the Spokane Civic Theatre has just come off its biggest ticket-sales season ever. How do you explain that? The answer: Yvonne A.K. Johnson. Johnson, 40, has been the Civic’s executive artistic director for five years – a period of remarkable turnaround. Michael Muzatko, president of the Civic’s board, certainly gives her the credit. It’s hard to argue with the results. When Johnson arrived from Minneapolis in 2005, the theater was in turmoil and in desperate fiscal peril. “The endowment board said, ‘You don’t have a lot of time. You have to get this theater turned around or we’ll have to close the doors,’ ” Johnson recalled. The week she arrived, the Civic was staging a show playing to 33 percent of capacity. So Johnson went to work drafting a budget and scheduling shows that would get patrons into the seats. “Now, if a show is under 70 percent, I have a heart attack,” she said. The theater is not only coming off its best ticket season, it also produced the best-selling individual show in its history, Gilbert & Sullivan’s “The Pirates of Penzance,” last fall. Johnson, not coincidentally, directed it. She turned what could have been a stuffy dud into a show that was a boatload of high-energy fun, with nods to Monty Python, Elvis and Queen Victoria. “A lot of forward planning came into that,” she said. Sometimes, budgets are balanced at the expense of quality. Johnson said she never wanted to go that route. In fact, she came in convinced that high production values were crucial to restoring the faith of both the audiences and the performers. In a community theater, which does not pay actors, the enthusiastic participation of performers is crucial. Listen to what one local performer and director has to say about Johnson: “I think she’s been a gift to the community. She has helped the Spokane Civic Theatre regain its standards as a glorious and reliable theater. And that’s from someone you might call a competitor: Reed McColm, the artistic director of Interplayers Professional Theatre. Muzatko, who is also an actor and performer (he was the Pirate King in “Penzance”), said she has won the respect of the acting community. Johnson has actually increased the Civic’s full-time staff by several positions. 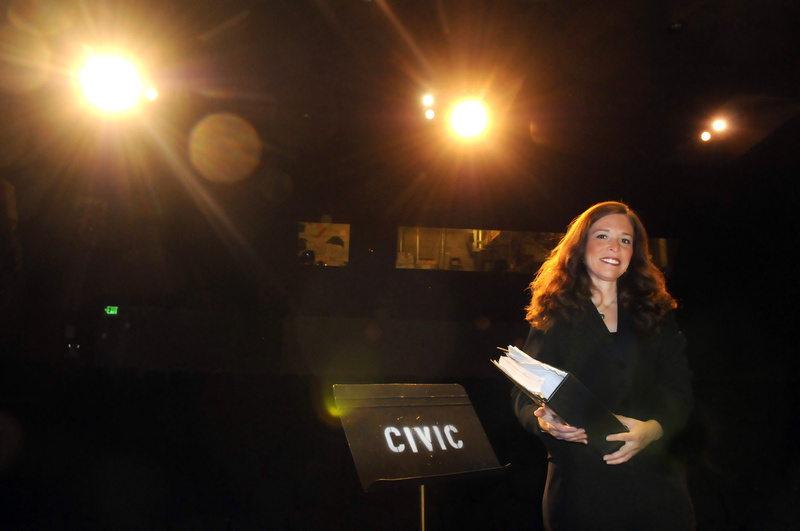 For the first time, the Civic will have a full-time music director. How can a theater increase staff and still remain fiscally solvent? By increasing revenues, which in the Civic’s case, are almost entirely dependent on ticket sales. Revenues have, essentially, doubled since she arrived. She also built up the theater’s training camp and classes for youth, called the Academy. It now accounts for 10 percent of the theater’s budget – and it has another advantage as well. “You start them early, and they might be actors, directors and theatergoers,” she said. Johnson grew up in Waukesha, Wisc., a suburb of Milwaukee. She discovered her love of theater by sixth grade, when she dressed up as a cavewoman and sang a song in a school show. She earned a bachelor’s degree from nearby Carthage College in speech, communications and theater, and spent a few years as a freelance director in the Milwaukee area. Then she decided that England was the place to immerse herself more fully in theater. Johnson went to the University of Essex in Colchester and earned her first master’s degree, in contemporary theater practice. She directed shows in London and Edinburgh. Johnson returned to the states and earned a master of fine arts at Minnesota State University-Mankato. After that, she was hired to run both the teaching company and the performance company at CLIMB Theatre, a large professional educational theater troupe near Minnesota. There, she was mentored by an executive director who taught her about budgets, audits and balance sheets – things they don’t teach in MFA programs. From there, she applied for the Civic post, where that financial training came in handy. Sometimes, her artistic instincts have been crucial to business success. For instance, last year she chose a show that few in the Northwest were familiar with: a raucous farce by Jeff Daniels, “Escanaba in Da Moonlight,” set in a Michigan hunting camp. It included a seven-minute flatulence gag. Johnson said she was lucky to arrive at a place with such a talented core. She said Nickerson has “been here every step of the way,” and she has appointed him resident director. She also gives credit to the Civic’s professional design team: Peter Hardie, David Baker, Dee Finan and Jan Wanless. Johnson said she is also grateful for the support of the board. It hasn’t always been easy. She arrived at the Civic in the wake of staff layoffs. Emotions were running high. On top of that, the theater had a fire and a flood in the boiler room during her first year. “Peter Hardie would say, ‘Well, you came back again today!’ ” remembered Johnson. With all of her family back in Wisconsin, she admitted that it got a little lonely in those days. Even now, being the person who is, in her words, “responsible for every dollar and every word at the theater” can be difficult. “I jokingly say to her, ‘Is the crown a little heavy today?’ ” said Muzatko, paraphrasing Shakespeare. Johnson doesn’t have much time for hobbies, although she loves travel, water-skiing, wine-tasting with friends and a daily walk through Manito Park, near her home. But she’s doing what she loves – and doing it well.